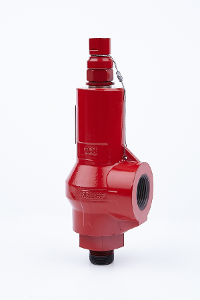 The V64 Series PED Certified Relief Valves have a wide variety of media applications including air, gases, CNG, and liquid relief applications providing both a repetitive and reliable bubble-tight seal. Constructed of Stainless Steel and Carbon Steel, along with a protective painted surface, the V64 Series has a working pressure of 6000 psi (413 bar) and a cracking pressure range of 15-5,500 psig (1.03 to 379 bar). When the inlet pressure overcomes the spring set pressure, it causes the V64 valve to open, releasing flow to bypass and thereby balancing the system pressure. Every valve is factory tested for cracking and reseal performance.